Accounts Payable (AP) is a basic function of every company. No matter what your business, you have invoices to pay, processes to adhere to, and accountability to document. As finance professional you are likely aware that missed early payment discounts, late fees, lost invoices, dozens of calls, emails, faxes, and other inefficiencies can substantially and unnecessarily drive up your operating costs. Beyond invoices and payments, there are compliance issues surrounding accounting. For example; Sarbanes-Oxley in the United States, Bill 198 in Canada, J-SOX in Japan, etc. All of these require an ability to keep track of and report on all aspects of your accounting system and processes including Accounts Payable. Failed audits resulting from lost documents or poor documentation can result in large fines, or a range of other penalties. Not to mention lost investor or creditor confidence. 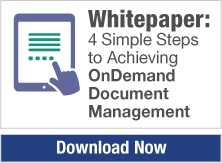 With DocuVantage OnDemand®, you can ensure processes are being adhered to and are fully auditable. DocuVantage's Accounts Payable Solution is an easy to use, affordable, on-demand service. DocuVantage OnDemand® offers a solution that can drive tremendous improvements in AP effectiveness, efficiency, visibility and accountability. DocuVantage OnDemand drives Accounts Payable processes (including document management, routing, approval, collaboration and even records retention scheduling) while seamlessly blending all of the associated invoices, POs, and other documents into the process. All via an intuitive Cloud-based platform. As a Cloud solution DocuVantage offers all users the advantage and the ability to access information from anywhere, anytime, and from any device that connects to the web (PCs, Tablets, Smartphones, etc.). There is never any hardware to maintain, software to install or upgrade fees to pay. And you can be up and running in hours or days, not months. With DocuVantage, AP performance improves dramatically. The organization can be more agile and proactive to organizational needs. And DocuVantage OnDemand® isn't just an accounts payable solution; you can share the same platform with your co-workers in other departments. One solution for all your company’s document and records management needs. Across the organization, system users can easily view and retrieve invoices, receipts, check images, POs, contracts, email, and other documentation. Managers then review and approve items when they are at the appropriate steps in the process, they can view all work queues for the members of their organization to manage or even redirect workflows with ease. The DocuVantage technology is complemented by our innovative subscription model, that helps organizations realize ROI as quickly as they see results from the use of the solution.